The 21st annual American Telemedicine Conference wrapped up last week in Los Angeles. The 21st annual American Telemedicine Conference wrapped up last week in Los Angeles. While there were amazing patient success stories, and a group of people dedicated to the success of telemedicine, it was slightly depressing that after 20 years, there are still people questioning the value and calling for more data as well as no consistent reimbursement except in rural settings. Considering that we can order just about everything at 3am from the couch in our pjs, it’s amazing that we still require sick (and possibly infectious people) to find their way to the doctor rather than offering at-home options. The exhibit hall was smaller this year. A number of people commented on this, and there seemed to be two reasons. First, there was an impression that this conference was too close to HIMSS for the big companies to get a booth shipped between the two conferences. This is partially good news though: telemedicine has gone mainstream into the biggest health IT conference. The second reason might have been that some vendors are struggling or have left the market. This is purely based on my observation but I didn’t see as many “all-in-one” hardware and software vendors, which makes sense when video conferencing is available on every computer and every mobile device. As well, vendors that sold “equipment” for telemedicine, like specialty carts were also absent. Vendor consolidation may also have accounted for some of this as well. So while a smaller tradeshow floor may have indicated a problem at first glance, it also points to market maturation. The reasons for implementing telehealth are changing from purely rural access and access to specialists to consumer preference. However, reimbursement has not caught up with this and most consumer-facing applications are cash-pay by the consumers. Lack of reimbursement despite the evidence supporting telemedicine remains a sticking point. Although I didn’t attend any policy specific sessions, reimbursement came up in every session I did attend. Tuesday morning’s plenary featured a lively debate about consistency in telemedicine. One camp held the position that without consistency of care we could not judge the validity of telemedicine, while the other asked why we would hold telemedicine to higher standards than the current system. While there is something to be said for not making the same mistakes in a new model, it did seem like some of the people in the consistency camp were using this as a reason to stall implementation. A new consumer-facing program by Southwest Medical Associates showed that telemedicine was no-less consistent than in-person, pointing out that antibiotic prescribing rate were identical for UTIs treated via telemedicine or in person. They also discovered that 70% of their telemedicine patients were women, which is not surprising given that women still bear primary childcare responsibilities, and getting to a doctor with kids in tow is not easy. In many cases, telemedicine was not seen to replace rather to augment existing care, especially for chronic disease patients where additional check-ins help them manage care and stay healthy. However, there were other examples of using telemedicine, especially after hours, to treat and triage issues to keep people out of the ER so that the ER could focus on the people who really needed to be there. In addition to providing access to specialists and specialty care telemedicine can provide basic access to care. Proponents pointed out that there are many areas of the country, where there is no access to primary care physicians, for example there are 30 counties within Texas with no PCPs. Of course this brings up another sticking point for telemedicine, which is licensure. Without an easy way for healthcare professionals to practice cross-state, it’s hard to solve this problem. In the consumer scenarios this is even more ridiculous, as many consumer-facing telemedicine solutions required that the first check for the patient be which state they resided in. Personally, I’d like to think that if someone has qualified to practice medicine in one state in this country they are competent in another. One of the most touching uses of telemedicine was for pediatric palliative care. There are very few palliative care centers for children, and they are also more comfortable at home. UC Davis Medical Center with the George Mark Children’s House used telemedicine to give families access to nurses remotely. Nurses at first expressed skepticism but were astonished at how much compassion they could share through a video call. 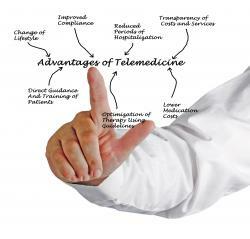 Telemedicine decreases no-show rates. Not surprisingly The Cleveland Clinic saw 100% show rates with patients when they did a video follow-up from surgery rather than being asked to drive 100 miles to a visit. Overcoming internal skepticism was often the biggest barrier. Marshfield Clinic physicians didn’t offer telemedicine to their older patients initially because they thought that they wouldn’t want it. Again, not surprisingly they did as older people often have greater challenges getting to the office, especially if they have had surgery or are no longer able drive. The idea that older people don’t want or can’t use telemedicine is another myth that needs to be dispelled for wider adoption. Looking forward to 2016, let’s hope that the sessions show fewer pilots and more system-wide implementations of telemedicine, an increased focus on patient preference for telemedicine, and a decrease in the regulatory barriers. The best sessions I attended featured real patient stories, while HIPAA is a concern, patients who had positive experiences were more than willing to have their stories told. Let’s hope more of those move us all forward. For a selection of our live tweets from sessions, see our Twitter feed.